Would anyone from Philadelphia survive a John Wick assassination attempt? Yeah, I’m thinking the Coggin is back. No. No they would not. God damnit I watched John Wick 2 last night and I’m still all FIZZED up over it. Good action movies are so hard to make, but somehow the John Wick franchise still finds fresh ways to keep itself relevant, which is a challenge considering it’s just two hours of a guy running around the world killing people with handguns. It had every trope I love in a great action movie: a hall of mirrors, hitmen with various fighting styles, gentlemanly agreements, it couldn’t have been better. I was so pumped up from watching the movie last night that I tried to put my wife in a modified rear naked choke, but she stabbed me in the leg with a fork (all the way to the bone) and warned me not to start something I couldn’t finish. God I love her. But it got me thinking…would anyone involved in the sports landscape of this city be able to survive with The Baba Yaga himself stalking them? No, no they wouldn’t, but would anyone be able to fight him off enough to deserve a death with dignity? Not in this city. And yes, I’m fully aware this is a dumb, sports talk radio premise of a column (HEY, WHO DO YOU THINK WOULD SURVIVE?! VOTE IN OUR POLL NOW) but I don’t care. I’m still filled with piss and vinegar from watching that movie. So who who would stand the best chance? We’re assuming Wick has only his bare fists to get the job done and his targets have ONE non-gun weapon of their choice to defend themselves. An exasperated father warned his daughter this morning that if she didn’t behave herself he would be forced to take her to tonight’s Phillies game. Charles Grandowitz, 42, of Cherry Hill, issued the threat to his daughter, Kaylee, 8, after she ignored his request to empty the dishwasher and clean her room. “Kaylee, so help me, if you don’t get those done like I asked you to by noon today, we’re going to go to that Phillies game tonight, I can promise you that,” Grandowitz said in a menacing tone as his daughter watched television. Maikel Franco, in happier times. Philadelphia, PA – Maikel Franco of the Philadelphia Phillies has been downgraded to questionable for tonight’s game against the Cincinnati Reds because the young third baseman cannot be coaxed out from his bedroom after staying up all night watching the Friday the 13th series. 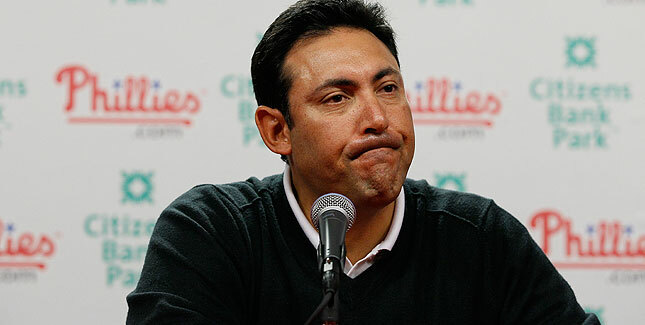 Philadelphia, PA – Speaking from his home, ex-Phillies general manager Ruben Amaro Jr. told reporters he was beginning to think the Phillies may not bring him back as the general manager for next season. “I don’t want to look to into this, but after they let me go from my contract and told me they would not extend me next year, this really leads me to think I may not be back with the organization in 2016,” he said. Amaro Jr. said he was nervous that nobody in the Phillies front office had been taking his calls since August and his official team email address had been deleted. Philadelphia, PA – A number of police officers swarmed to Citizens Bank Park earlier this afternoon when front office officials called the authorities after former GM Ruben Amaro Jr. locked himself in his office and was actively trying to trade away several pieces of the roster before leaving the premises. Phillies Executive Andy Macphail met with the media as police officers dragged the kicking and screaming Amaro Jr. from his office before forcibly ejected him from Citizens Bank Park. Several members of the Philadelphia Fire Department had been summoned to the stadium and had to chop down Amaro Jr.’s door to allow police officers entrance.